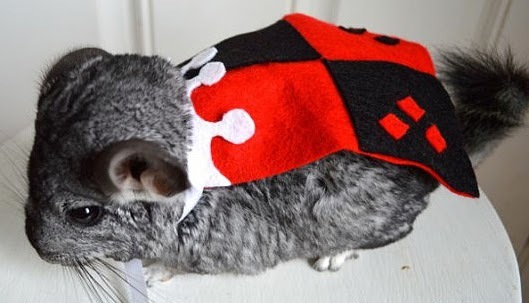 Just because you stand in front of their cage 364 days of the year waiting for them to do something funny, doesn't mean when it comes to Halloween, your prized hamster / guinea pig / chinchilla / bunny rabbit can't get in the spirit of things and perform a trick or treat dressed as your favourite super-hero or villain. Enter Etsy sales lady Marmota Café. 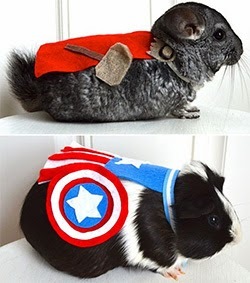 She has designed a range of fancy dress alternatives for your furrier than Wolverine friend, and her range covers all the big guns, from The Joker and Batman, right through to Flash and Green Lantern. While Robin's doesn't yet come with matching elven shoes, Captain America comes with a shield, and Thor's with a mouse-sized Mjolnir! While dying the pet blue and dubbing it 'Beast' might seem the cheaper option, these costumes are incredibly well-priced. 'What about a female or villain option' you ask? Well to round off, here's one that combines them both, I mean who doesn't like Harley Quinn? What do you think? And Harley's still wearing more than her DC52 version! To see the full range on offer, or to order your own of the ones shown here, visit Marmota Café after the jump.